A New Addition to the Family » What's Under the Needle? It's getting close to Christmas and this year I've had a new addition to the family, little Sarah, which means I need to make a new Santa sack. So far I've made all the kids one each. 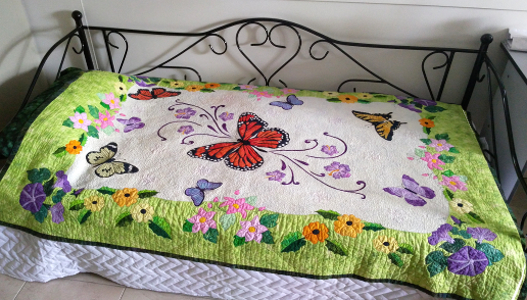 Amanda (her mother) loved the look of my butterfly quilt (pictured below) and requested butterflies on the new sack with a present or two. I drew up a rough sketch on paper and then set about making the sack using Thomas's (Sarah's brother) sack as a guide for size. I started with the main background piece and added two gift boxes, one purple and one yellow. 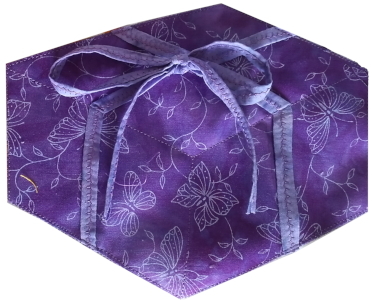 To add a little extra interest, I made a tie to form a 3-d bow on the purple box. 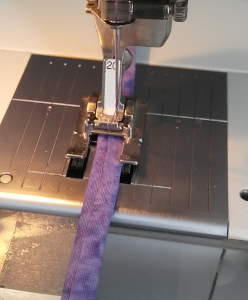 To make the tie, I cut a strip of fabric and then folded over both raw edges to the back. I tucked one of those raw edges under and that covered the other, then I zigzagged down the middle. 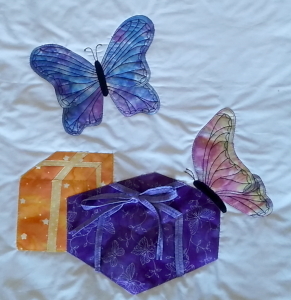 Next, I added 2 butterflies, one on the edge of the purple gift and one flying. The stitching definitely brought them to life. I also added Sarah's name along the top. It didn't look very Christmasy, so I edged top and bottom with some red snowflake fabrics. I boxed the bottom so the sack can stand and added a blue snowflake lining to finish off. 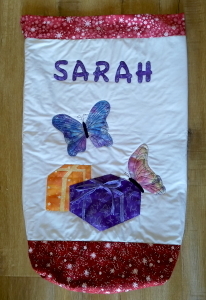 These Santa sacks are always fun to make and being a designer I made mine up as I went - it only took an afternoon to create which was great because I am a little limited for time this week. If you need a pattern to follow, then check out Jennifer Houlden's design. 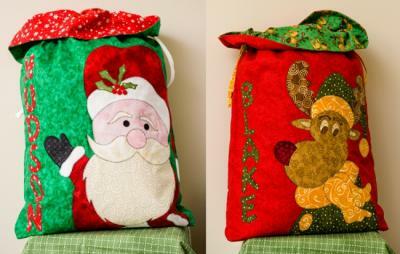 She has some really nice Christmas designs and all the letters are included with instructions to make each sack complete. One of Jennifer's patterns - contains both designs.